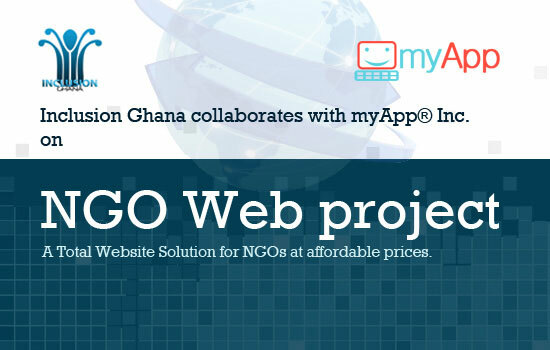 NGO Web Project collaboration between Inclusion Ghana and myApp Inc.
NGO Web Project is a project to provide a total solution websites for its members and other interested not-for-profit organizations at very reduced and affordable prices. Website Management On-Site Training and Search Engine Optimization would be offered free of charge. The only thing you will pay for is your Domain Name and Hosting and design of your website. myApp� Inc. believes the best way it can contribute to help the vulnerable is to support organizations that work for them. It is a corporate social responsibility to make impact through the impact makers. 3. Content Management System: Update and manage your website yourself. Add, Edit, Delete information on the website with an easy content management system. 8. Downloads: Make documents like PDF, Images, MSWord available for download. 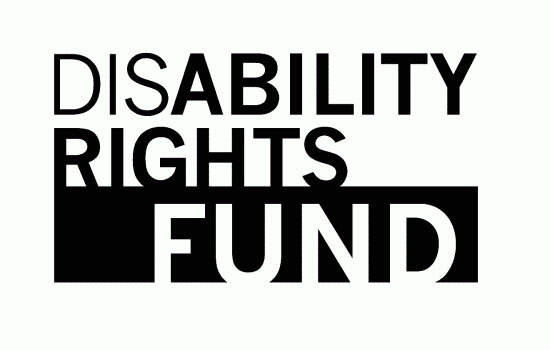 Disability Rights Fund (DRF) has approved a grant in the amount of US$20,000.00 to Inclusion Ghana. Present juridical structures and practices make it very difficult, if not impossible, for persons with intellectual disabilities (PWIDs) to efficiently claim and exercise their rights. Legal professionals lack understanding of the challenges faced by PWIDs and how legal instruments should fit into the reality of their situations. In accessing the justice system for PWIDs, other groups of professional that one is likely to work with are social workers, the media, police and parents. All these group of professionals need to increase their knowledge of human rights, their knowledge of the CRPD and be able to ensure effective access to justice for PWIDs. This grant therefore will support Inclusion Ghana in ensuring equal recognition before the law and effective access to justice in Ghana for PWIDs through raising awareness, training, and court actions The awareness raising will target the general public through the media, while the proposed training will target justice system professionals, media representatives, social workers, persons with intellectual disabilities, and their families; and court actions will be initiated in cases of violation and abuse of rights against persons with intellectual disabilities. The grant is being awarded through DRF�s Small Grants funding stream, which provides grants to single organizations or partnerships to increase skill-building opportunities and rights-based advocacy and monitoring for disabled persons organizations. Achieving the Millennium Development Goals on Universal Education and respecting national legal frameworks and international conventions on the right of the child means that government must take steps to ensure that all children are able to participate in the mainstream educational system. Although Ghana is implementing Free Compulsory Universal Basic Education, its current form limits the participation of children in the mainstream school system especially children with special needs and disability. As part of efforts to bridge these gaps, the Ghana Education Service through the Special Education Division (SpED) developed a draft policy on Special Needs and Inclusive Education (SNIE) which aims to promote Inclusive Education at all levels in our educational system. However, to ensure that stakeholders� concerns are dovetailed into this policy, a 2-days stakeholders� forum was convened to review the draft SNIE policy. 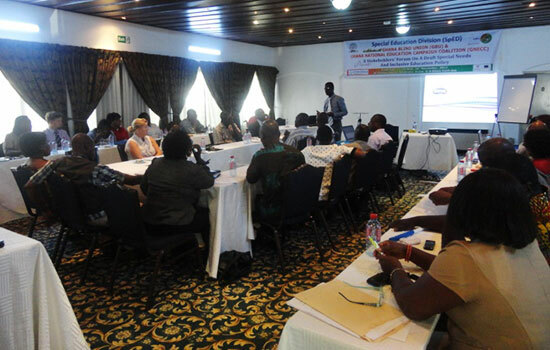 The forum organized by the SpED in collaboration with the Ghana Blind Union and Ghana National Education Campaign Coalition brought together 40 participants representing government departments and agencies, local and international NGOs and donor agencies, as well as civil society organizations. Inclusion Ghana was well represented by secretariat staff and representation also came from some of Inclusion Ghana�s member organisations namely Special Attention Project, Autism Awareness Care and Training, and Awaawaa2. Participants present were able to carry out a comprehensive review of the draft SNIE policy and offered useful proposals and comments to help enrich the draft SNIE policy. 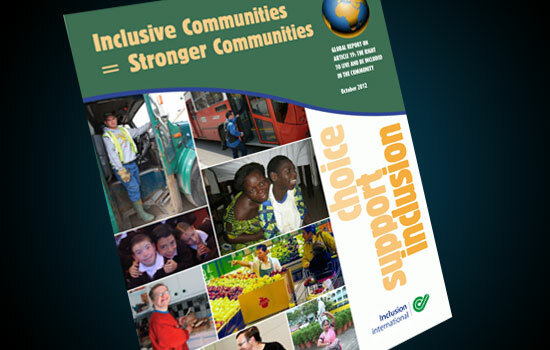 Inclusion International's Global Report on the Right to live and be Included in the Community was launched in October 2012 during the National Convention and International Forum-Achieving Inclusion Across the Globe, in Washington DC. In contribution to the report, Inclusion Ghana shared stories from self-advocates, families, and member organizations. Despite the promise of the Convention and Article 19 the reality for the vast majority of people with intellectual disabilities is that they are almost always denied the right to make decisions about where and with whom they want to live. They have little or no access to services and supports (other than those provided by their families) and they are excluded from participating and contributing in their communities because community supports are not welcoming or accommodating and/or because they lack the supports necessary to use these services (e.g. accessible transportation, personal supports, financial capacity). While many issues emerge from the collection of experiences and knowledge of people with intellectual disabilities and their families in this report, the central messages from self-advocates and families were: Choice, Support, and Inclusion. Get more information from the Report. It is available for download in the Report section under Resources. "Cheerios, Cheerios" said a little boy called Nortey one day to his big sister. Stunned by her brother's request, 9 year old Nana ran to inform their mother. "Ma, Nortey just asked for Cheerios! Nortey just asked for Cheerios!" To any other family, a demand for cereal is an everyday non-event. But for the Quaynors it was a miracle they had been praying for since Nortey was diagnosed with autism, a condition that delays development. "My son hadn�t uttered a word until that day, aged 4 years old", explains his mother Mrs. Serwah Quaynor. Tears roll down her cheeks as she retells the story that gave her hope all those years ago. It has been a long and painful journey for the woman who first refused to believe the heart breaking diagnosis. "I died inside that very day" confesses Aunty Serwah, as she is affectionately known. "I spent 2 years going from place to place. 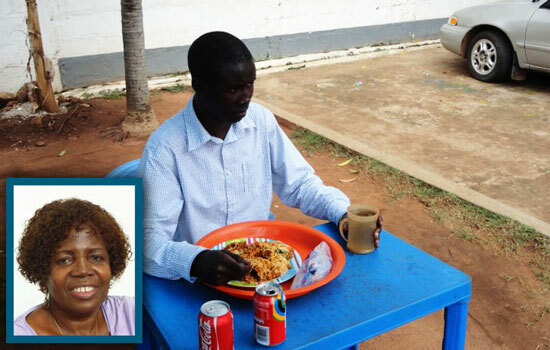 We undertook so many tests before I finally had to accept that Nortey did have autism." Autism is a complex brain disorder that inhibits a person�s ability to communicate and develop social relationships, and it is often accompanied by extreme behavioural challenges. Persons living with the disability typically have problems with communication, social interaction and leisure or play activities. Their future is often uncertain, however children with autism are considered to be intelligent and academically able. Aunty Serwah says Nortey who is now 30 years old, was able to attend mainstream school in the United States while receiving the necessary support and that Nortey is now working so who knows what his future holds, I am very hopeful though. Hope has been the driving force for Aunty Serwah being, who started her journey to raise awareness in Ghana 10 years ago. Committed to furthering her child�s development she began searching for support for both herself and Nortey. She discovered that although there were a number of families caring for children with autism, there was little support available. This is how Autism Awareness Care and Training Centre (AACT) came into being. Little did she know then that this was the beginning of Ghana's very first day centre for children with autism. AACT's aim is to provide a safe haven for children with autism, somewhere for the children to learn and a place parents can meet and discuss their children's development, challenges and achievements.